By now, New York City's fashion week has come and gone, bringing with it the hottest wedding fashion colours and styles for 2010. What's in store for the cutting edge bride this season? Check it out..
Gone are the days of simple elegance. 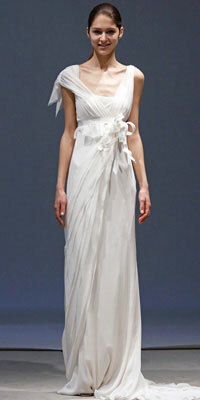 In 2010, bridal gowns take a turn for the dramatic. We say good-bye to straight, slender skirts and herald-in the full on ball gown. Full bodied fabrics create big skirts while intricate details complete the look. Another dramatic line for this season is the 50's inspired "mermaid" dress. In keeping with the dramatic influence of this season's exuberant designs, a gown that is slender through the hips but flares into an exaggerated trumpet skirt will be just as popular as the full skirted ball gown. are going to be huge for 2010. 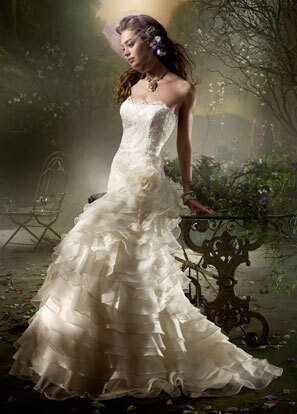 Whether they are on the skirt, the bodice, or the veil, ruffles will be everywhere! 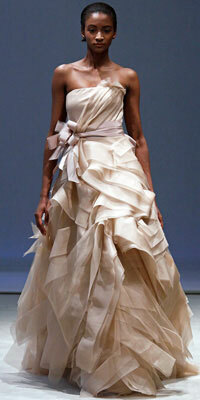 Even strapless gowns will have ruffles on the neckline. Perhaps a little bolero jacket over your strapless gown is more your style? If so, the jacket must have the ruffles to make your look complete this season. Also read: 2010 Fashion Trends: RUFFLES! Big draped layers in the skirts will also be popular as will three dimensional floral appliqués and pinwheels. Gowns this season will also see the reappearance of crystal accents, especially on satin dresses. Wedding Gown Trends 2010: Beads and Sequins and so much more.. In order to create the full and fabulous looks that will be so hot this year, designers have opted for the heavier, more luxurious fabrics like satin and taffeta. Some 2009 favourites will still be around for 2010. For example, asymmetry is still very hot. One shoulder dresses will continue to dominate runways; however, designers have taken this popular trend and have elaborated on it further by creating dress "architecture". This is just a fancy way of saying that designers are playing with fabric a lot more this year, creating much more draping and ruching (ruffles or lace trim) on bodices and skirts. Fabrics will not be left to simply hang. It will be very rare to have a dress without some sort of pleating, gathering, or folding. In some ways, this pleating and gathering is similar to 2009 designs, however, the soft chiffons of last year will be replaced by the heavier satins and taffeta. Another architectural aspect in bridal gowns for 2010 will be "intentional imperfections". Vera Wang, for example, took silk organza and tulle fabrics with raw torn edges and artfully incorporated them into her gowns. This eclectic yet edgy look makes the gown look "imperfect". This imperfection is one more of the hottest trends of 2010. Hot or not, your wedding dress has to fit your body, suit your style, and be comfortable enough for you to wear all day. This season's designs have given us some room to breath with fuller skirts and more detail options; however, if you are the kind of gal that prefers the straight lined dresses, fear not. There will be plenty of those in the repertoire as well. There is a little bit of everything in this year's mix; so, head out there and try some on for size...enjoy!